A woman is furious after receiving a receipt from a Panera Bread restaurant insulting her. The woman, who asked not to be identified on camera, told Channel 2's Nerferiti Jaquez she visiting the Panera Bread at North Druid Hills on the way to pick up her son. 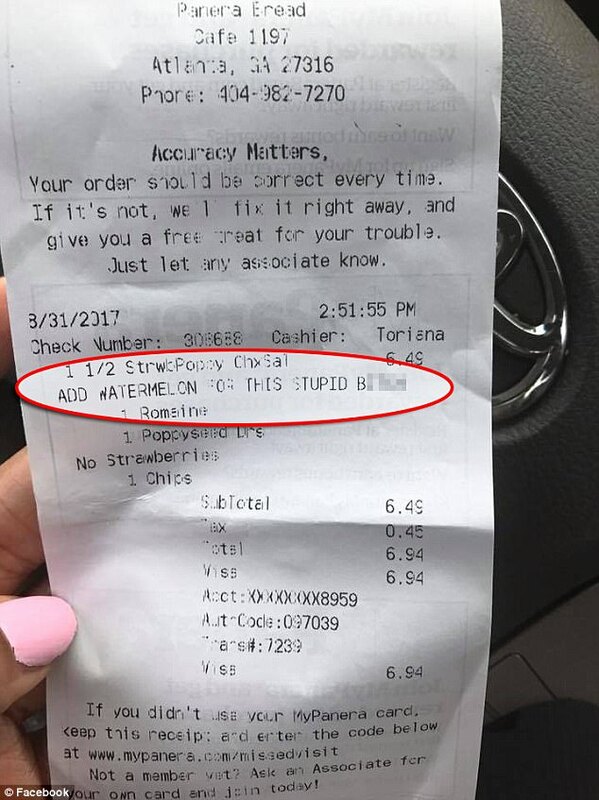 When she asked for a substitution on her salad at the restaurant, she received it and a note on her receipt calling her a "stupid b**ch." "I was floored. What are your morals? What does Panera Bread stand for?" she asked. The woman says she immediately went to the manager and said the manager said he'd talk to the cashier and asked if she wanted him to remake her salad. Upset, the woman says she left and then called their corporate office. "The response that I got from them just didn't feel like they felt like it was a big deal," she said. She decided to post the receipt on Facebook and vent her frustration. At Panera, we have a zero tolerance policy for this kind of behavior and the associate has been terminated as a result of this situation. We are focused on fostering a warm and welcoming environment for everyone, and this incident is not indicative of the way that we treat our guests. The customer says she's satisfied with the response but wished it was handled professionally from the beginning. "I feel like if I didn't use social media as my platform. I don't feel like I would have been heard," she said. The customer says she used to come to the restaurant to relax at least once a week but now says she won't be back again. how did she type that up on a receipt.